Madam Ellen Johnson Sirleaf is the 24th President of Liberia and Africa’s first democratically elected female Head of State; is serving her second term as President after winning the 2011 presidential election. She’s one of the three who won the Nobel Peace Prize Laureate in 2011. 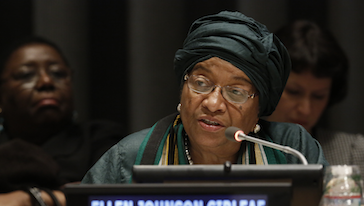 Madam Sirleaf has throughout her career demonstrated passionate commitment to hard work, integrity, good governance and has been advocating for the rights of women and the importance of education to provide a better future for her country and its people.